Elmer Hoehn Estate Auction — Harritt Group, Inc. The estate of the renowned Elmer Hoehn, offers at live auction this purposefully built and designed 1950’s one-story brick residence on nearly two acres on scenic Utica Pike along the Ohio River. This home offers more than 3300 square feet of living space on the first floor with an expansive view from the front rolling lawn, a finished basement and attic, a sunroom and courtyard in private backyard plus an attached 2-car garage all located just a short walk to Duffy’s Landing, 2 1/2 miles from downtown Jeffersonville and easy accessibility to the bridges of Louisville. A rare buying opportunity offering serenity within the city. Also selling personal property including a Chrysler Minivan, furniture, antiques, collectibles, lawn equipment, tools and household items. Brimming with rich history, this spacious suburban home provides for what a home should be, a tranquil escape from the fast-paced world beyond the grounds. 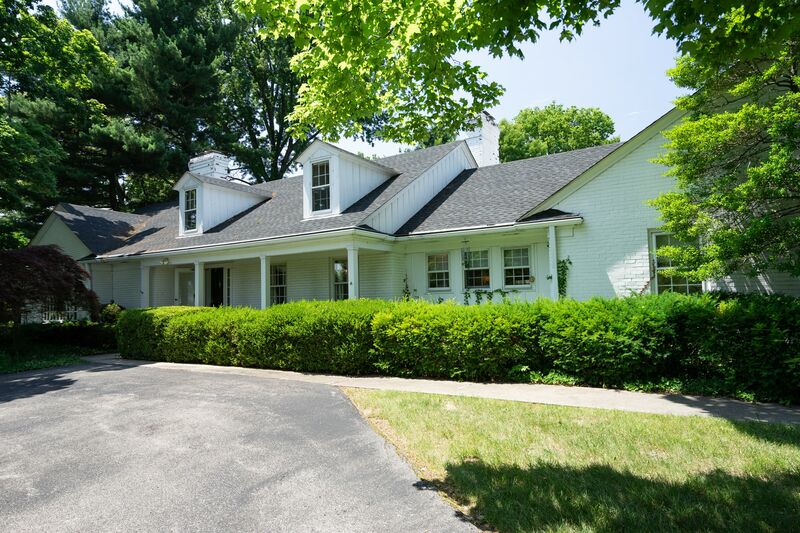 Sitting on the highest point of the manicured mature treed lot, this setting will allow you to enjoy the beauty and tranquility of Utica Pike and the Ohio River. Once inside, the thoughtfully designed rooms include three bedrooms, two full and two half baths, a large kitchen with lots of windows, breakfast room with butler’s cabinet overlooking sun porch, laundry room with amenities, formal dining room, a spacious living room with a 60-pane window view of the front rolling lawn and a private study with built in cabinetry off sunroom. An additional 2000 square feet in the lower level plus a wide staircase to the finished attic – just perfect for a children’s playroom. Built with distinction in its era this home features solid wood panel doors, raised panel entrances, 4’ wide hallways, built-in linen closets and an abundance of fireplaces that create a warm ambiance that is perfectly complemented by the grounds, gardens and the view. A true treasure! 10% Non-refundable down payment due day of auction, balance due in 40 days. Taxes prorated to day of closing. Possession at closing. Selling as is without contingencies, all inspections welcomed prior to auction. 2007 Chrysler Town & Country minivan, 39,500 miles, various body damage. Cash, check or wire transfer. Title transfer immediate upon payment of cash or wired funds. Possession and title held for 14 days with payment by check for bank clearance. 1940’s cherry glove box dresser w/mirror, 1940’s cherry dresser, chest, nightstand & shaving mirror, Hitchcock style deacons bench, antique oak & walnut lamp tables, retro dinette table & chairs, mission oak arts & craft rocker, maple bar/server cabinet, cherry Queen Anne console & coffee tables, vintage cream sofa, Duncan Phyfe lamp table, 1940’s platform rocker, floral motif armchairs, retro 1970’s colorful striped sofa, (2) retro swivel arm chairs, (2) walnut Victorian beds, antique walnut desk/table, painted yellow chest, vintage metal kitchen cabinet, telephone bench, (4) vintage industrial armchairs, chaise lounge, brown leather ottoman, oak TV cabinet, (2) blue recliners, (4) rolling upholstered chairs, lift chair, vintage oak office table, assorted bar stools, rattan patio furniture, Costco kitchen step stool, walnut executive desk, vintage office chairs, TV stand, ornate gold mirror, cherry candle stand table, mechanic bed frames, computer desk, (4) file cabinets, open bookshelves, iron patio table, chairs & glider, aluminum patio furniture, magnavox console stereo, mahogany kneehole desk, French provincial chest and more. Vintage mens Hamilton wrist watch w/box & vintage 1968 gold filled Longines Ultra-Chron LM-95 10K watch w/original box. Large 48-Star American flag (5’x8’) w/letter documenting flown over the US Capital on May 14, 1956, early hand painted wood checker board, Sealtest galvanized milk box, Occupied Japan binoculars, vintage Zenith Transoceanic radio, Univex 8mm movie camera, vintage Kodak, Bullet, Spartus & Brownie cameras, Tasco & Spion binoculars, wood rocking horse, oil on canvas landscape painting of barn, 50’ Belknap Bluegrass tape measure, sheet music, banjo, Bruce Fox copper relief oriental womans plaque, Zimmerman paperweights, Lladro figurines, vintage colorful mixing bowls, bar items, Earl Coleman lantern, barn lantern, brass blow torch, vintage office supplies, retro canister set, brown stone pitcher, Puppy Love Hummel, vintage Indiana atlas, vintage map, 1938 & 1939 Jeffersonville High Topic yearbooks, vintage LP records, 1964 LBJ bolo tie and others, selection of LBJ books & memorabilia, large selection of history, political and law books including Lincoln, Lewis & Clark, Baird Clark history book 1960’s Political Satire book and others, Ernie Pyle Brave Men book, old lighters, advertising tins, vintage ice bucket, baby scale, Falstaff Beer keg, 1970’s phones, 1960’s Soviet Life magazines, 1950’s Indy 500 glasses, (5) Derby Day 1959 Racing Tickets, several oilman drinking glasses, seltzer bottles, Vote Democrat podium & gavel and more. John Deere 317 riding lawn mower, 5hp Easy Vac pull type lawn vacuum, Lawn Tender gas powered chipper, Quiet Blow gas powered push blower, small single axle utility trailer, Craftsman 110 volt compressor, Craftsman pressure washer, weed eaters, Craftsman red rolling tool chest, large selection of yard, hand & power tools, drills, saws, vices, assorted hardware, paint sprayers and more. Maytag high efficiency top loader washer, Whirlpool Cabrio Steam front loading dryer, Harman Kardon 430 receiver, (2) large KHL speakers, Vizio 50” flat screen TV, Panasonic RU31 DVD/video player, JVC TD W354 dual cassette player, Realistic TRC 440 CB, Edenpure heaters, Schwinn Airdyne, Proform 585 treadmill, 9X12 floral wool rug, china, kitchenware, glassware, small appliances, cast cookware, assorted prints, lamps, card tables, vacuums, linens, handicap accessories, sundial, bird bath, bird feeders and other yard art. Court Avenue to South on Spring Street. 2/10 mile to left on Market Street. East 1.7 miles, continue onto Utica Pike an additional 3/4 mile to home on left.